may be your inner you, the way you wish you looked, or the way you remember looking at some time in the past. It may also represent what’s important to you, a person or place or activity. Try to think of something that reveals the real you. This doesn’t have to be serious; it can be whimsical or fun. All sides of the piece should add up to 80″. That means it can be a 20″ square, or a 15″ by 25″ rectangle, or whatever shape you wish, as long as all the outer edges added together equal 80″. There should be a recognizable spot of red somewhere on the piece. It needs to be bigger than just a line of red quilting thread. This is due at the December 2015 potluck meeting, where we will display the pieces and vote on our favorite. This challenge is based on the Leila Adam book, Tile Designs: More Than 100 Ready-to-Use Tiling Patterns, which is in the CPQlibrary. It can also be found used, very inexpensively;ISBN1-55407-485-1 or 978-1-55407-485-3. The book was actually designed for laying tile, but since it’s all squares and half-square triangles, it adapts easily to quilting. The author adapted many designs she observed in the Middle East, especially of Islamic art. 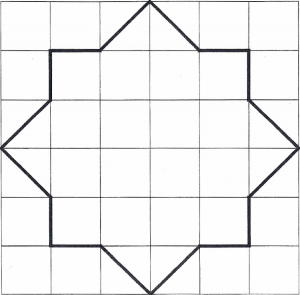 A feature common to many of them is the eight-point star formed by superimposing one square on another, rotated 45 degrees. Please download the full challenge to see the examples.